« Harry Potter And The Cursed Child Midnight Party! 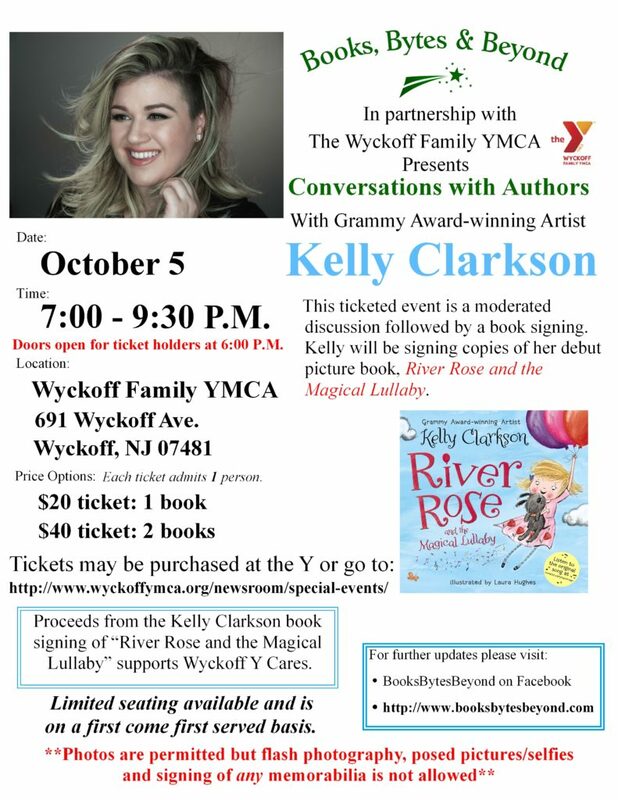 Books, Bytes & Beyond in partnership with The Wyckoff Family YMCA is thrilled to present Grammy Award-Winning Artist Kelly Clarkson for a moderated conversation followed by a book signing. Please note that there is no personalizing. The original Idol, singing sensation Kelly Clarkson, makes her picture book debut with this enchanting story inspired by her own daughter, River Rose. She will be discussing River Rose and the Magical Lullaby, an enchanting picture book that chronicles the night before an imaginative little girl’s first trip to the zoo. The book comes complete with a link so you can listen to an original lullaby written and performed by Kelly herself. It’s a rollicking, rhyming tale from America’s most beloved performer, recording star Kelly Clarkson. Come along on this bedtime journey with an original lullaby that parents and kids are sure to love! Please feel free to share this email with family and friends who might be interested in this event. Our special event with Kelly Clarkson is tomorrow!!! Tickets will not be sold at the door, so if you want to be a part of this magical evening click on the link above and get your tickets today!! !